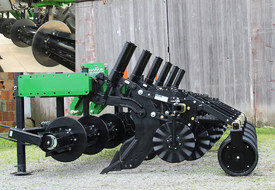 Cover-Crop Roller for Ripper-Stripper Tillage Tool - Unverferth Mfg. With the growing popularity of cover crops for enhanced soil and water conservation measures, Unverferth Manufacturing Co., Inc. introduces a cover-crop roller option for its popular Ripper-Stripper® strip-tillage tool. The front-mounted cover-crop roller features chevron-patterned blades to propel it through the field while deflecting and crimping residue away from the row for easier planting. A smooth blade cuts residue ahead of the shank for greater material flow. The roller features rubber-cushioned mounting for easily following ground contours and smooth traveling over field obstacles. The cover-crop roller option is available for 6- and 8-shank rigid models and 8- and 12-shank folding machines with 30”, 36” or 38” row widths. The Ripper-Stripper strip-till tool features ¾”-thick, special-alloy deep-till auto-reset or shear-bolt protected shanks that till from 9” to 18” deep for shattering hardpan. The shanks are constructed with patent-pending heat-treated shark-fin points and wearbars for easier pulling, extended shank life and reduced soil disturbance. The heavy-duty 6”x6” double-wall frame means maximum durability. Seedbed tillage options include a wide variety of shank-mounted opposing coulters with multiple blade styles. Also available are a variety of leveling options including several choices of Rolling Harrow® baskets and press wheels. All feature parallel-link mounting for consistent operating depth and are width, depth and down-pressure adjustable. For additional information, growers are encouraged to check with their nearest Unverferth dealer or visit umequip.com for complete details.